Translation industry is a dynamically developing market with enormous volumes of information processed daily. To streamline translation work process we all need good and reliable software tools, CAT tools in particular. 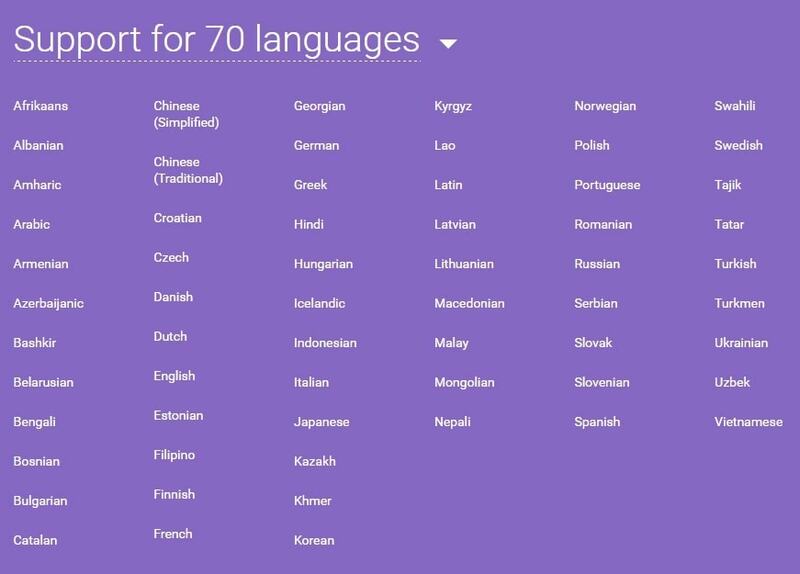 Thanks to the industry big players now we have a wide variety of solutions to make a translator’s live easier. I have already covered some of the tools in my previous post. In this review post, I would like to share information about one of my favorite CAT tools on the market: SmartCAT. 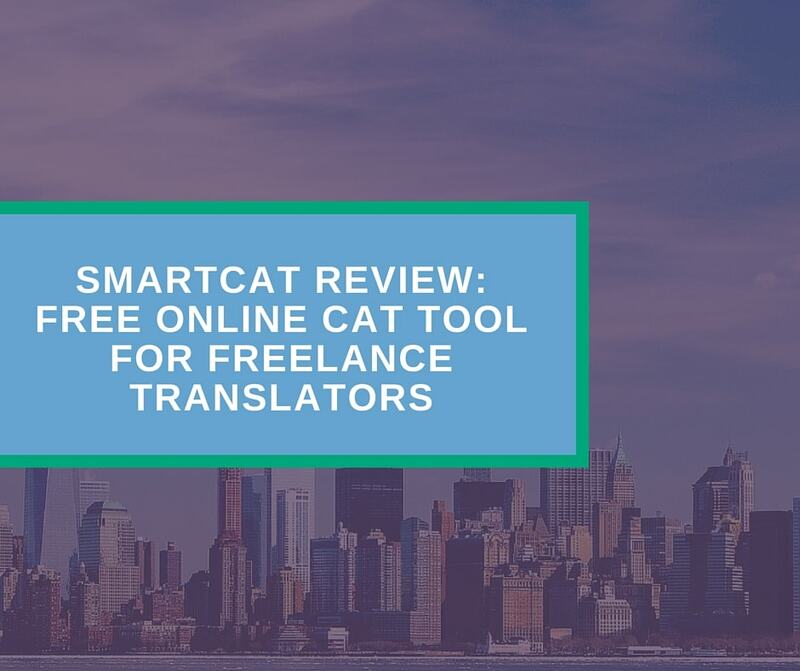 SmartCAT is a powerful cloud-based tool for freelance translators, LSP, and companies. It offers a full set of features required for fast, effective, and quality translation. What is more important – it is a completely free tool for freelance translators. 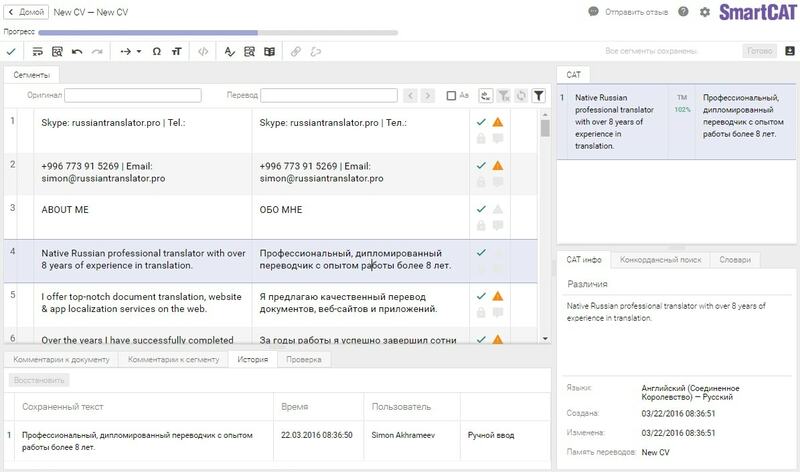 In addition to CAT functionality, SmartCAT helps to arrange translation process from getting jobs to receiving payments. However, in this case, 10% of each transaction between you and your client will be deducted to help keep the platform up and running. You can also purchase additional services, such as machine translation and OCR packages. 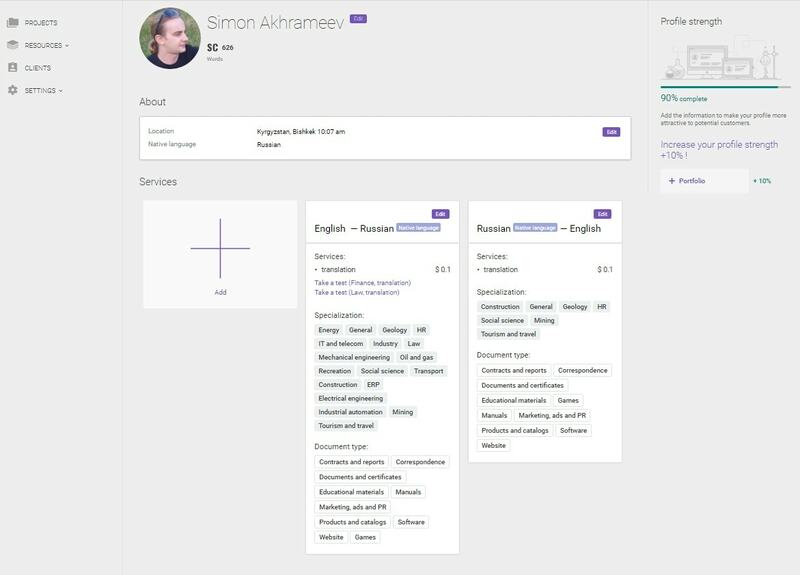 You can create translator’s profile, add personal information and start receiving job proposals from clients, registered in the system. 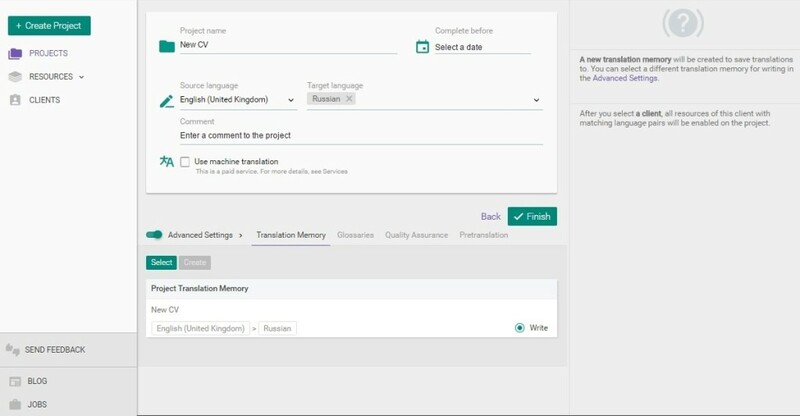 You can manage translation resources, such as TMs and Glossaries, use inbuilt dictionaries, and run QA check right from the editor (or from project dashboard). In Services section, you may indicate what kind of language services you offer. Now it includes Translation, Editing, Proofreading, Post-editing. 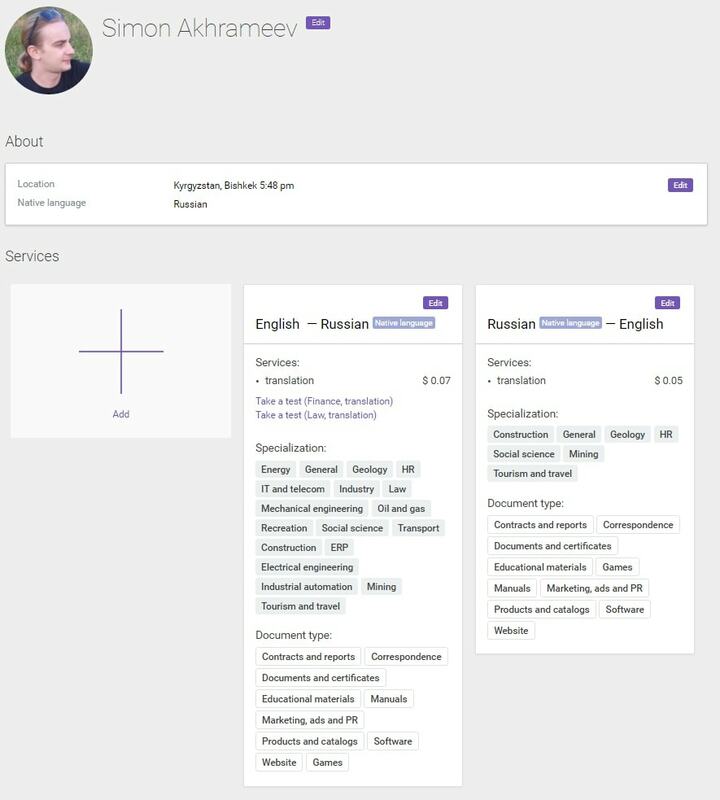 You may also add source and target language, the cost of services in USD per word, fields of specialization, and types of documents your work with. SmartCAT dashboard consists of two sections: left sidebar (Projects, Resources and Clients tabs) and the main area, where you can manage resources and projects. Click Create Project button, drag and drop (select) a file to create your first project. On this stage, you may add existing translation memory in TMX format. Click Next. On the next page, you will see detailed project settings. Set project name, the deadline for completion, source and target languages, use advanced settings to create translation memory, glossary, set up quality assurance and pretranslation sources. You may also use machine translation, but this is a paid feature. Click Finish. You have just created your first project tin SmartCAT. Now it is available in Projects tab where you can manage all aspects of your translation projects. To start translation, click on you project name in the list and click your file name under Documents section of the page. SmartCAT editor will open in a new browser tab. The editor has all essential items that you have already seen in other CAT tools. Going from top to bottom you will find a progress bar, toolbar, search tool with filters, two columns with SL and TL segments, comments, revision and QA check sections. The right sidebar of the Editor includes two sections: the upper one for TM results, and the lower one with CAT info, Concordance Search, and Dictionaries tabs. Many translators work with confidential data under non-disclosure agreements. No wonder that we all are concerned about privacy and security of translation assets. All of your assets as a translator, such as your translation memories, glossaries, and other details of projects you’re working on, will always remain yours and only yours. This type of data is secure in SmartCAT and is never made available to other users. Encryption methods also keep your documents secure during transit and in cloud storage. The system uses an HTTPS protocol and is only accessible to authorized users. You remain the sole owner of your resources, and only you can manage access to them. Till date, I’ve been using SmartCAT for several months already. I connected to SmartCAT via one internet provider from Bishkek, Kyrgyzstan. Over this period, the platform was rather stable and available all the time. SmartCAT works rather fast, Editor loads within 8-10 seconds, dashboard loads even faster – 1-3 sec. (at a connection speed of 3 Mbps). I think SmartCAT shows rather good results for cloud platform with such a great functionality. The editor works smoothly without freezing. Loading of segments and concordance search, as well as dictionaries, is also rather fast. However, I think that loading of search results will depend on document and TM size. SmartCAT has modern looking, user-friendly design with intuitive functionality and settings. Being a seasoned user of various CAT tools, I would like to note that SmartCAT team managed to create a cloud tool with impressive functionality and put it into a well-designed shell that is simultaneously fast and convenient. I have already noted rich functionality of SmartCAT. It has all necessary features to organize translation process from start to delivery. You сan create a profile, provide personal details, set rates and get ready to receive job requests. You сan upload documents, TMs, and glossaries, create new TMs and glossaries, use the inbuilt dictionary, search through SL and TL segments, run concordance search and perform thorough quality control with multiple checks that will help you to produce a high-quality translation, avoid unfortunate typos and other stupid mistakes. Work process in this cloud tool was rather smooth and actually there was no need to contact SmartCAT support, therefore, I cannot say anything about their support team. Nevertheless, this is a good indicator of operational reliability. As I already mentioned, you can manage all translation assets in Resources tab. This is very convenient. In addition, you may purchase such functions as OCR and machine translation (if you ever use it). 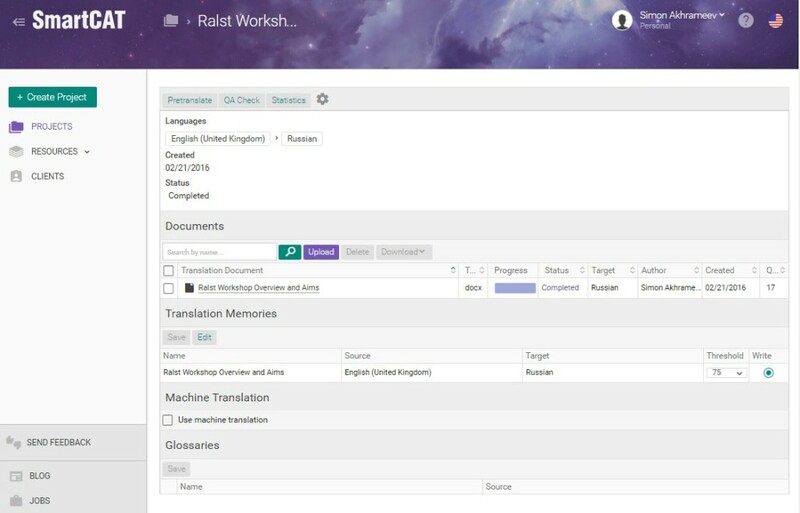 Though there is no collaborative translation memory as in MateCAT, SmartCAT offers inbuilt ABBYY dictionaries for free, which is quite good for general translation purposes and you don’t need to switch between Editor and Dictionary windows. Currently, SmartCAT is one of my favorite online CAT tools: it is free, simple and reliable. What else can a freelancer dream about? This CAT tool has all necessary features to perform fast and efficient translation work. Moreover, SmartCAT offers solutions for LSP and Clients to streamline translation workflow and management.